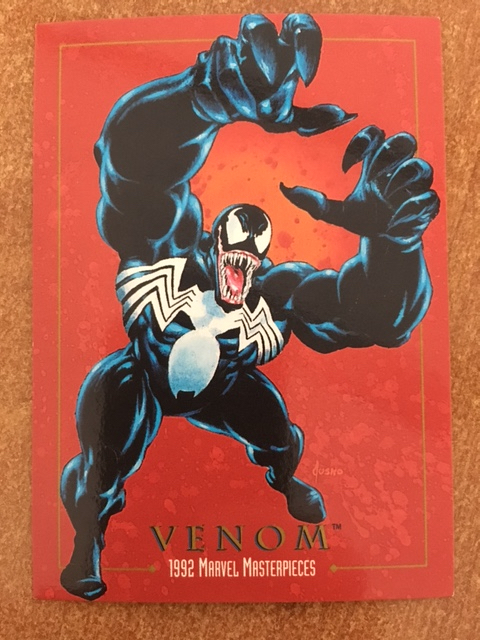 Today’s Marvel tarot card draw is Venom. Venom is the result of the merger between a human and the venom symbiote (a corrupted alien Klyntar that couples with hosts to survive). Originally, the venom symbiote’s first host on earth was Spider-man, but thankfully he was strong enough to separate from it. However, the venom symbiote then merged with host Eddie Brock, who hated Spider-man for a number of reasons, and became the vicious super-villain bent on destroying Spider-man we know today. The Venom vs. Spider-man narrative symbolizes the struggles we face with our own shadows. In the creative and artistic practices, we could think of this shadow as the opposing forces to expression, exploration, and activism – or basically anything personal or societal that prevents us from creating. For example, self-devaluation (often exacerbated by societal norms), is a common shadow plaguing artists that can lead to inaction or creative withdrawal. Helping others see the value in what they create and be confident in their work is part of the good fight that keeps this dark symbiote at bay. Further processing this Venom card, I was also reminded of this popular Ted Talk by Elizabeth Gilbert who wrote the wildly successful book Eat Pray Love. In this talk she discusses the old idea that great artists, writers, and other virtuosos are not geniuses themselves, but rather that they are visited by a genius, or “a divine attendant spirit of creativity” during moments of inspiration. This idea helps explain those fleeting moments of ingenuity that drive artists to create at seemingly random or inopportune times. It turns out that non-corrupted Klyntars are actually a lot like these geniuses that Gilbert writes about. They are in fact well-intentioned hosts seeking symbiotic relationships with people of good will, augmenting their powers to serve a higher purpose. It is only when they encounter a host with ill-intent that these symbiotes become dangerous. So, what are our takeaways from this venomous Marvel Monday? Don’t let negative thoughts about your artistic value, abilities or potential contaminate your creative genius symbiotes! Instead, shine light on your artist shadow and help others glow a little brighter while you are at it.